In The Beach Bum, Matthew McConaughey is the most Matthew McConaughey that McConaughey has ever McConaugheyed. Armed with scraggled, hay-colored hair; flip-up shades; psychedelic Hawaiian print shirts; and constant PBR tallboys, Moondog (McConaughey) has the outer appearance of a grizzled, careless sea dog. But in reality, Moondog is “the most prolific poet in all of Key West, Florida.” This according to a dive bar musician, who allows Moondog on stage to sing along and then riff an unformed piece of poetry. Tag is a movie about tag. The children’s schoolyard game. It is quite sincerely about this, and nothing else. 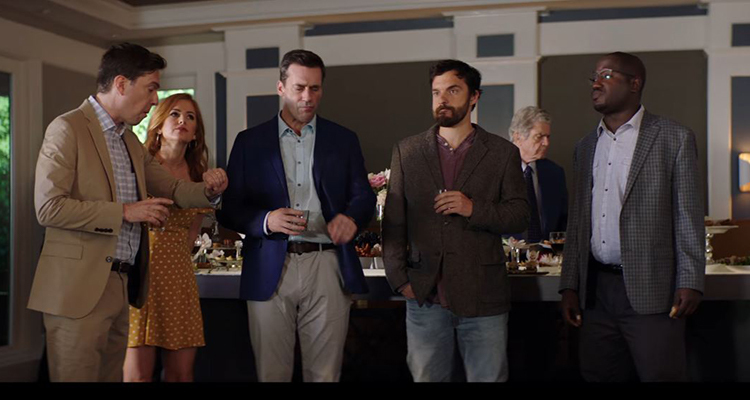 Based on a real-life Wall Street Journal article, the film follows an annual game of tag played by a group of five grown men. One is a wealthy businessman (Jon Hamm). One is an unemployed stoner (Jake Johnson). One is so dedicated to the game that he gets employed as a janitor just to instigate a tag (Ed Helms). One is a self-professed paranoid man who also happens to take everything that comes at him with the chill demeanor of a Hannibal Buress (Hannibal Buress).